Boz was pulling the last piece of boar meat towards him when he saw a tiny face across from the campfire. He had started his journey just recently, and it had surprised him to find a cave Squig in the wilderness of Ind. Well, it could barely be called a Squig. The poor thing was terribly emaciated and less than a little slender for a small specimen of its kind. Curiously the Squig peeked around the campfire. Boz snorted and the little Squig started grunting and bared his stubby little teeth. Boz could not explain it, but somehow he liked it. That little titch actually wanted to mess with him. 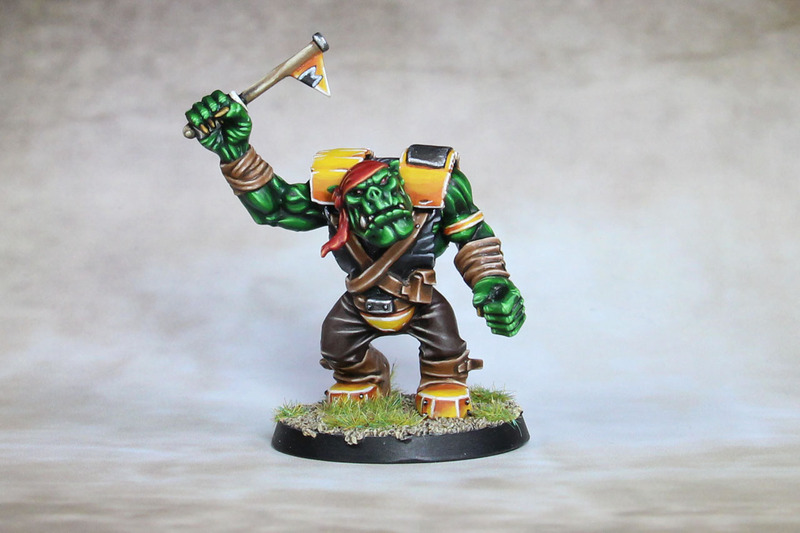 Him, a Blood Bowl legend! And that even though he was many times smaller and completely without a chance. For a moment he wondered if he should not just eat the little Squig, but instead he tore off a small piece of the boar and threw it to him. Greedy the Squig swallowed it with almost a single bite. 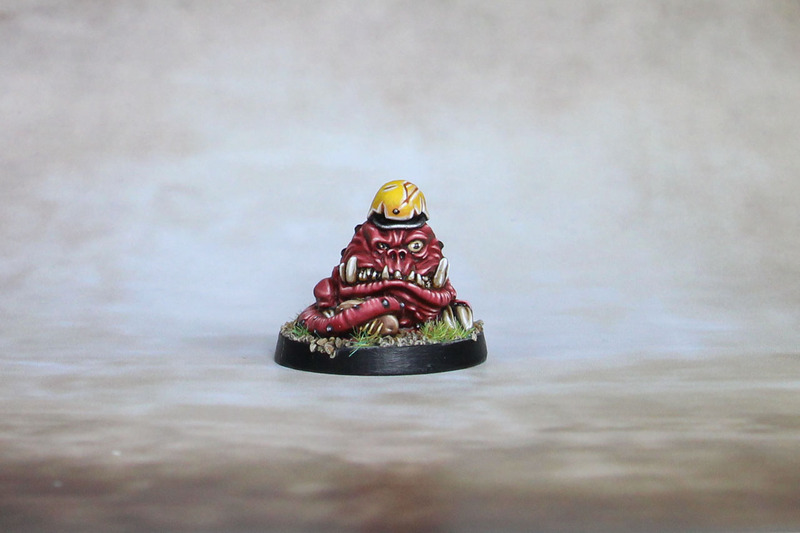 He waited a moment, then looked at the Squig Boz again. After another piece the Squig stared at him again. Boz gave him another bite, but held on to the piece of meat this time. As the Squig bit into it, Boz drew the ever-rumbling little thing closer and examined him more closely before releasing the meat. He patted it on the head and the Squig allowed it, even though his grumbling would have intimidated any other Orc. After Boz had eaten something himself, he left the Squig the rest. Only a short time later he sank down next to the tree trunk he had chosen for as nights camp, the Squig waddling in with cautious steps. Finally, he sat down next to Boz and closed his eyes. Every time the Squig exhaled a faint grumble could be heard. "I'll call you Grumbla. You can stay with me, but I'll warn you...it's a long way to the Maulers." he said. When I painted the Squig, I realized that I had nearly enough models to set up a team of fans and so it was not long before I gave the team a little more punch with a Black Orc. The model was a find in my bitz box and consists largely of a 40K Ork Nob and the head of a Flash Git. The flag comes from the old Mighty Empires map set by Games Workshop and was more of a coincidence than intention. I liked that so much in the end that I will probably equip more fans with flags in the future, should I still be able to find some of these parts somewhere. Paintwise Blackorcs still pose a challenge to me - somehow I never really succeed in hitting the right skin tone. Although I am satisfied with this result, the way to get there was long and frustrating as I repeatedly had to cover the entire skin with a green wash so that the transitions were not too hard. Here I will have to experiment for a while, until I have found a good recipe. Ulag was a Blood Bowl player several years ago, but decided to follow the call of the sea. After plundering countless ships as a pirate on the oceans for some time, however, he felt the urge to return to the field and so he played in the smaller shipbowl leagues for a while. When he heard of the Maulers regathering, he did not hesitate and as a faithful fan went on his personal mission to join the team. With that I have shown you all of my painted fans. Over time, I'll probably paint some some more for practice purposes, which will fill up the bleachers nicely, but for the next article we'll start focusing on the story a bit more.